An attachment specialist and a clinical psychologist with neurobiology expertise team up to explore the brain science behind parenting. 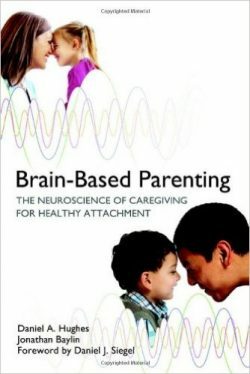 In this groundbreaking exploration of the brain mechanisms behind healthy caregiving, attachment specialist Daniel A. Hughes and veteran clinical psychologist Jonathan Baylin guide readers through the intricate web of neuronal processes, hormones, and chemicals that drive—and sometimes thwart—our caregiving impulses, uncovering the mysteries of the parental brain. The biggest challenge to parents, Hughes and Baylin explain, is learning how to regulate emotions that arise—feeling them deeply and honestly while staying grounded and aware enough to preserve the parent–child relationship. Stress, which can lead to “blocked” or dysfunctional care, can impede our brain’s inherent caregiving processes and negatively impact our ability to do this. While the parent–child relationship can generate deep empathy and the intense motivation to care for our children, it can also trigger self-defensive feelings rooted in our early attachment relationships, and give rise to “unparental” impulses. With this awareness, we learn how to approach kids with renewed playfulness, acceptance, curiosity, and empathy, re-regulate our caregiving systems, foster deeper social engagement, and facilitate our children’s development.